The payment industry is in the midst of a revolution. The shift to cashless commerce and digital payments has transformed the way we pay, the services we use and our expectations as customers. With the explosion of bitcoins, mobile wallets, “tap and go” payment transactions, peer-to-peer money-transfer apps and more, the mobile payments market alone has grown from $235 billion in 2013 to a projected value of almost $800 billion in 2017 and over a trillion dollars by 2019. According to PwC, regulatory and industry initiatives, customer demands for personalized services, the evolution of FinTechs, and new technology are leading to increasing openness and collaboration in the payments industry. Customers are demanding real-time, agile, and personalized payment services. Digital commerce is a key way to acquire customers, develop relationships, drive revenue and reduce costs. The digital commerce technology ecosystem includes payments. Transitioning to digital payments, however, is not without challenges. To ensure a positive customer experience, service providers must be able to process payment transactions in real-time and ensure the highest levels of reliability. They also need to be able to scale capacity ahead of demand and employ sophisticated analytics to help prevent fraud, ensure regulatory compliance and identify actionable insights from the data they are collecting. That’s why in order to meet today’s real-time, banks and payment services are opening their infrastructures to leverage technology enables such as open APIs and instant payments, which eventually help enhance the overall customer experience. Instant payments, also known as ‘immediate’ or ‘real-time’ payments (i.e., Real-Time Rail, or RTR), offer many benefits to all payment stakeholders, be they end-users or service providers. Instant payments are defined by the Euro Retail Payments Board (ERPB) as electronic retail payment solutions that are available 24/7/365. They result in the immediate or close-to-immediate interbank clearing of the transaction and crediting of the payee’s account with confirmation to the payer (within seconds of payment initiation). 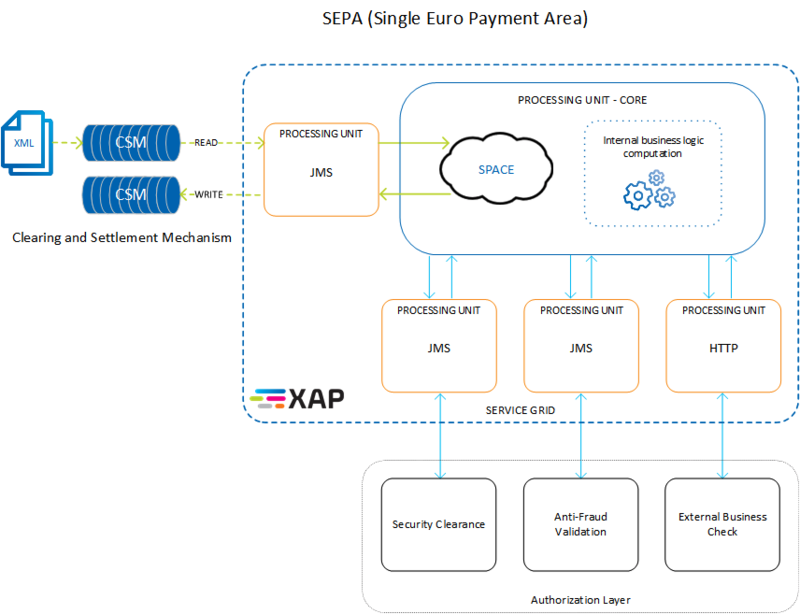 In Europe, the Single Euro Payments Area (SEPA) allows customers to make euro payments throughout Europe as easily, securely and efficiently as they do today within their own countries, with no distinction between national and cross-border euro payments: they are all considered domestic. With over 25 national instant payment systems already live today around the world, and many others in the planning or development phase, instant payments is rapidly becoming the “new normal” for electronic bank payments. Each country develops its own real-time payments system and often these have their own brand names such as Faster Payments in the UK, FAST in Singapore, NPP in Australia, Express Elixir in Poland, Straksclearingen in Denmark, Swish in Sweden. Instant payments help online retailers automatically track purchases and other server-to-server communication in real time. This allows eCommerce systems the opportunity to store payment transactions, order information and other sales internally. In particular, instant payments have the potential to develop in the person-to-person and person-to-business segments in situations where cash and cheques are currently widely used. They may reduce the cost of managing cash and cheques, which are the most expensive means of payment at the level of the entire economy. They further facilitate electronic and mobile commerce payments. With GigaSpaces’ in-memory computing capabilities, payment service providers can enable and accelerate instant payment solutions and meet regulatory requirements on a global scale. The following customer use case presents a common Instant Payment flow, which is based on the GigaSpaces event-driven feature and low latency calculation power. This solution has been fully deployed. The Clearing and Settlement Mechanisms (CSMs) publish a message (xml file) to its JMS outbound queue. The JMS PU reads the xml file from the CSM queue, parse it and writes it to the core PU space. First write will trigger a sequence of async calls to an external verification system (Security clearance, Anti-Fraud validation and finally an External business check). Each callback will initiate the next step in the flow (async call). Once the last verification is approved, it will return the OK result object to the CSM inbound queue. CORE PU – Stateful processing unit containing the data and the business logic. JMS PU – Stateless processing unit responsible for inbound and outbound JMS calls. 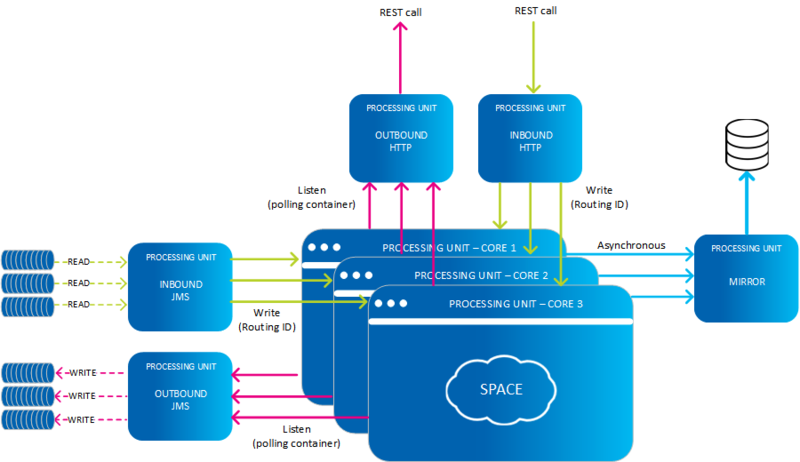 HTTP PU – Stateless processing unit responsible for inbound and outbound rest calls. Mirror PU – Stateless processing unit responsible for flushing the data async to the backing store. By 2020, people around the world are expected to make 726 billion transactions using digital payment technologies. All across the globe, changes are being made to existing payment systems to help financial institutions exchange payments faster and more frequently, giving individuals and businesses more immediate access to funds. Real-time, instant payment capabilities for consumer and business payments are on the rise. European financial institutions are more focused on cost optimization to improve efficiency and margins than their counterparts elsewhere. This can be attributed to the head start Europe has over other regions in the implementation of open banking. The revised European Union (EU) Payment Service Directive (PSD2), with its requirements on more extensive data sharing and push for the broader use of APIs, has accelerated this. In the US, some of the largest global banks have launched real-time payments in an attempt to catch up with Europe by enabling people to send money instantly between bank accounts. Real-time payments are expected to result in faster and more convenient payments and money transfers while enabling new and modern ways for customers to pay. The wait for a payment to transfer to or from your account will soon be a thing of the past, thanks to most banks moving to real-time payments. Looking for an instant payment solution? Contact GigaSpaces to learn more about how we can help.